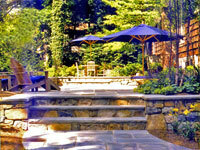 Bluestone happens to be one of my favorite patio or walkway materials. The main reason is because it is a beautiful natural stone. 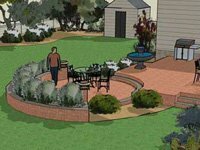 If you are thinking about creating a new patio or walkway, or even replacing an existing one, you may not be sure about what paving stone or material to use. You should consider bluestone for a variety of reasons. As mentioned it is a natural stone. Natural stones happen to look good with their surroundings. For example, whether your home is wood or vinyl siding, brick, stone, or a combination of the above, bluestone will most likely go well with it. 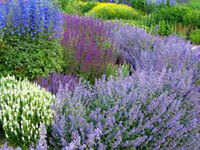 As a natural material, it is nice to know that a natural resource is being used. Bluestone can either be taken from quarries or found in woods and fields. Bluestone comes in a few different color ranges. You can get it uniformly all blue. Full range is another choice. The stones have various shades in them such as blues, tans and a bit of purple. This is very pretty. The third color range leans towards the greens.....not one that I use. You can either dry lay or wet lay bluestone. If dry laid, there is no concrete used and therefor no chance of future cracking. Joints can be narrow and filled with a type of sand that will harden. If wet laid, concrete is used as a base and also in the joints. It comes in different shapes and sizes. You can use regular geometric forms in various sizes or the same sizes. There are also free form bluestones. 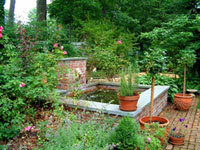 You must use a contractor or mason that has experience with laying bluestone. Often the material is not completely square, which means that your joints will be crooked. The contractor must be prepared to do some cutting to make things exact. 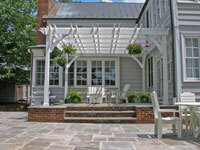 Bluestone is generally not used for paving around a swimming pool as it can get very hot.